Usually we look for alternatives to the most popular trails. These are often at least as good or even better, not only for the nature and views, but especially for the tranquility. If you hardly encounter anyone on your path, you are much closer to nature and the views leave a deeper impression. For example in Yosemite, we chose for the lesser known (but bigger) brother Cloud’s Rest above the well-known Half Dome. Zion National Park is somewhat different. To immediately respond to the question in the title: No! 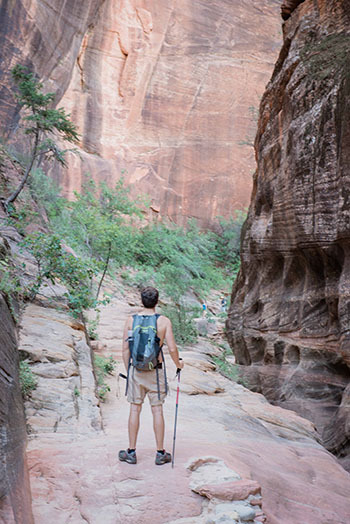 While there certainly are other beautiful trails, Angel’s Landing remains a must do! This post will show you why and immediately give tips to escape the crowd even in a summer weekend. Beforehand we obviously have done our research: what trails should we do in the different parks? What are the alternatives to the crowded trails? 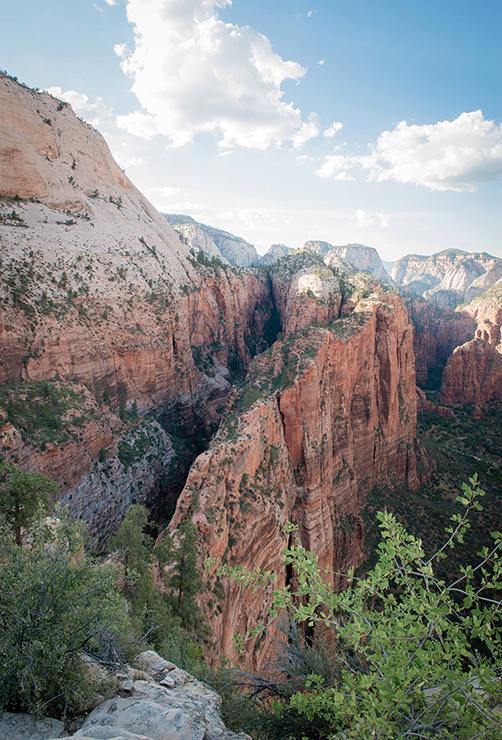 If you just search on Google, you’ll find that many prefer Observation Point to Angel’s Landing. So that’s the one we must do! No sooner said than done. We got up early and left for the day hike to Observation Point! At 6am we took the first shuttle bus and yes, it was already well loaded. 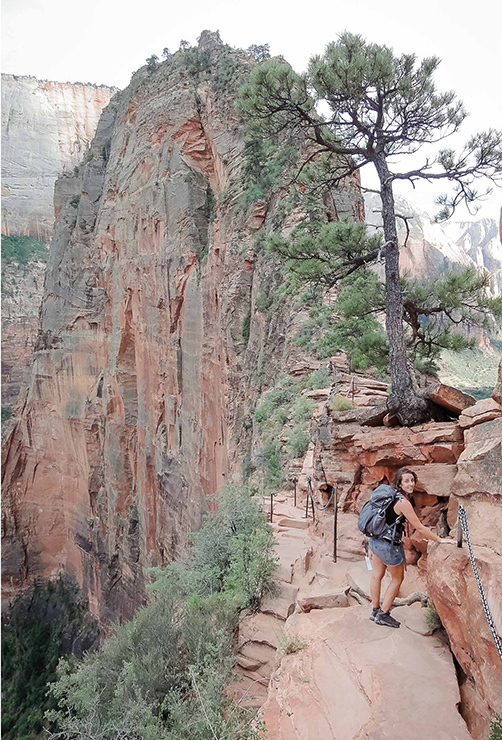 Most of them were candidates for the main attraction Angel’s Landing, who thought to be ahead of the crowd. Luckily just a few individuals also get off at “our” stop. We immediately start our hike from the trailhead to the summit. Yes, it’s a wonderful trail and we hardly came across others. In the second half we met some backpackers who walked in the other direction, after spending the night at the viewpoint. It was certainly clear that this indeed is the trail to avoid the crowds. Amazing, we were the first of the day on top of the canyon. A magnificent view, all to ourselves. Correction: to ourselves and some curious chipmunks. After some time of pure enjoyment and the necessary pictures we left for the descent. Still in the morning, we returned to the campground. Unexpectedly we still had to spend a whole afternoon after our “day hike” to Observation Point. And mmm, the trip tasted for more. 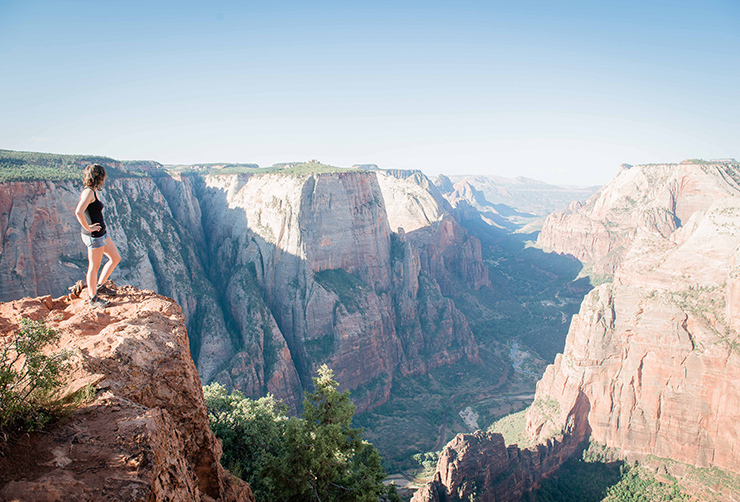 Shouldn’t we just add Angel’s Landing to our program? Shortly afterwards, it all was planned: we’ll spend the afternoon relaxing at the campsite to start our hike to Angel’s Landing around 5pm. The idea was to somewhat avoid the major crowd by starting rather late. And that is necessary, when you see the row to the shuttle busses! The journey to the summit was beautiful but less to enjoy. The crowd was definitely already reduced compared to a few hours before, but still too present by our standards… Especially at the start of the final part with chains – just after Scout Lookout – the traffic jam was sometimes frustrating. That had a lot to do with some irresponsible tourists trying to drag up their way too young children by all means. You will quickly notice that the first part of the chains is very busy, but that most drop out on the way. This causes the traffic jam, but luckily creates a quiet continuation of the path. Once that chaos is beyond, it really is a revelation! Suddenly all frustrations disappeared and we noticed how beautiful and unique the trail is. On the steep small ridge, immediate left and right of you yawns the deep abyss. Although this should be somewhat intimidating, it makes you feel free and euphoric. This is the place where only an angel could land, according to Frederick Fisher in 1916, and today we are standing here! Our plan was successful: only a few hikers accompanied us at the top and it was too late to expect others. After all, you don’t want to descent in the dark. After Observation Point in the early morning, again a stunning view of Zion Canyon. This time, a 360° panorama that is more varied, unique and therefore even more impressive. Here you can stay for hours. Unfortunately we have to leave this beautiful scene after some time. During our descent it was one-way traffic, making the chain area much more safe and even allowing you to take some pictures. 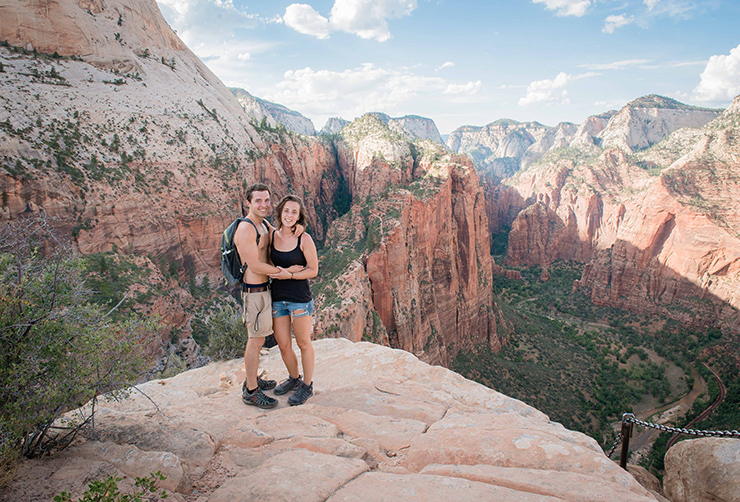 For us it was the perfect day with two beautiful hikes, of which Angel’s Landing indeed clearly stood out. 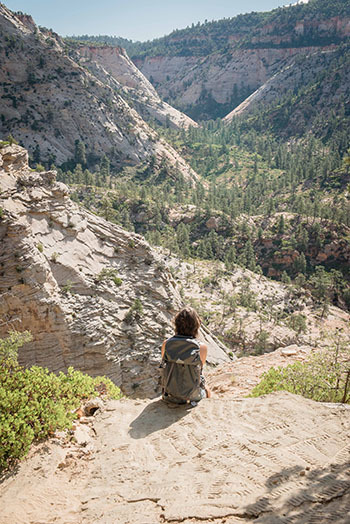 The unique view combined with the adventurous ascent turns Angel’s Landing into an unforgettable experience.